SPAIN’s Maria Alvarez Ponton made endurance history by becoming the first rider to hold both World and European titles at the same time following a convincing win at the FEI Meydan City Open European Endurance Championship held over the weekend in Assisi, Italy. Alvarez Ponton has now stood on the medal podium for three year’s in succession. With her 13-year-old French-bred gelding Nobby – world champion under entirely different conditions in Malaysia in 2008 – she also took individual bronze at the FEI European Championships at Barocca D’Alva in Portugal in 2007. She crossed the line at the end of yesterday’s tough contest in the shadow of the magnificent Saint Francisco's Basilica in 8hrs:10mins: 58secs to complete at an average speed of 19.5km/hr. The European individual silver medal went to Belgium’s Rachel Jaumotte with Dikruhu (19.1km/hr) while France’s Romain Laporte took individual bronze with Novisaad d'Aqui at an average speed of 18.7km/hr. The UAE’s Sheikh Abdullah Bin Faisal Al Qasimi finished 10min behind Alvarez Ponton to take the Open European second place with Castlebar Sobia adding to his own recent silver medal winning success at the FEI World Championships for Juniors and Young Riders held in Hungary. Rachel Jaumotte took the third place in the Open European section. Fifth-placed Germany’s Sabrina Arnold’s Beau 36 was awarded the coveted best condition award. Teenager Emma Mason has earned a first time selection in the New Zealand endurance horse riding team. The Upper Hutt College year 10 student, and her eight-year-old Arab horse Tararua Mistalight, will be taking on Australia's top endurance horse riders at Ruahine in November. Emma, who recently turned 15, has more than seven years experience in competitive endurance riding and is more than ready for her first chance at trans-Tasman endurance team eventing on November 21-22. Her selection is further development of an endurance career which has seen her represent Wellington at the North Island championships and later being chosen for the North Island team to compete at the New Zealand competitions. Maoribank resident Emma and her mount Tararua Mistalight, who grazes in Kaitoke, along with central North Island rider Michael Wakeling, are the two junior selections in the New Zealand team, which will compete against the Australians in a 100 kilometre race across farmland. In endurance riding, the winner is determined by which team has the fastest cumulative times recorded by the first three team members to cross the finish line. The Australian team will compete on borrowed New Zealand horses, while the New Zealand team will later travel to Australia for return competition. The trans-Tasman contest, described by the endurance racing followers as the equivalent of the Bledisloe Cup, can be expected to be hotly contested as New Zealand looks to wrest back the title. The trans-Tasman event was first held five years ago and won by New Zealand for the first three years. To complete is to win. It's a simple philosophy Karen Rhodes takes into each endurance ride she tackles. With that in mind, she is a winner many times over. The holder of the most buckles for competing in the Shahzada marathon, a gruelling 400km event held over five days, the Woodstock horsewomen maintained her perfect record with trusty companion Shadow in another taxing ride, the Tom Quilty Gold Cup. Rhodes was one of seven Lachlan Endurance Riders' Club members to tackle the 160km one-day ride in Victoria last weekend. Rhodes and Shadow successfully completed their fifth Quilty together, while Alan Lindsay notched his 10th buckle and Mark Lindsay his first, both with a time a tick over 18 hours. Included among the local withdrawals were former winner Andrew Bailey, Robin Gossip, Mary Symons and Ray Rhodes, all failing compulsory veterinary examinations with their entries. That's why reaching the finishing line is a major achievement in itself. "That's the whole thing with endurance, it’s slow but to complete is to win," Rhodes said. "There's five legs and you have to come in and vet at every leg. "It was a good, testing ride, not over the top." Rhodes' finishing time in a touch over 19 hours was more than nine hours adrift of the Matthew Sample and Brookleigh Ricardo winning combination. That doesn't bother her, though, in a sport she regards as a hobby rather than a business it is now with Arabian interests. "To complete a ride in that sort of time, they're superb athletes these horses and the people that ride them are professionals. That's what they do," she said. "Once upon a time it was just everyone's hobby, now it's a business." Shadow and former horse Kelly have been the mainstays of Rhodes’ endurance riding career. Between the two they have combined for 14 of Rhodes' 15 Shahzada buckles. She estimates they have clocked 7,000kms each in competitive rides, excluding training. But all good things must come to an end and Shadow, a striking Arabian Cross stock horse, seems destined for retirement after his latest campaign. "He could have been a more competitive horse if he had a different rider," Rhodes joked. "I've been competing on Shadow eight years and in that time he's completed six Shahzadas out of six, five Quiltys out of five and a couple of state championships. "He's been an incredibly sound horse. "He's always been ridden slowly so I guess that's why he's lasted so long. "You get to know them inside out and they get to know you." It is Shadow's efforts in the Shahzada which will most be remembered. The NSW Endurance Riders' Association 2008 Distance Middleweight Horse of the Year helped Rhodes to her 15th buckle out of 16 attempts at the Shahzada in the rugged terrain of St Albans where the Hawkesbury River meets the Blue Mountains. No rider boasts more buckles. Meanwhile, the Lachlan Endurance Riders' Club will hold a ride at Woodstock Showground on the weekend of October 17-18. The vet will take place between 9am-12pm with a 20km social ride and a 40km training ride on the Saturday. On Sunday there will be a social, training and 80km ride. The club are encouraging people to come and try the sport and enjoy the beautiful countryside, see what endurance riding is all about. Day membership will be provided. Confirmed this morning the official classification of the European Championships of Endurance of Assisi, results that do not include countries outside Europe. The former Italian champion Simona Garatti Z'Tadore on the Maury and Martina him on Jo Farouza brilliantly conclude their ordeal at the 16th and 18th place by setting the hourly average to 16.62 kilometers. the first and the second at 15.46. A short video from the Camp checkpoint of the 2009 Tom Quilty held at Tonimbuk, Victoria. Abu Dhabi: Reigning world champion Maria Alvarez Ponton of Spain won the gold medal while the UAE's Shaikh Abdullah Bin Faisal Al Qasimi took the silver in the FEI Open Meydan City European Endurance Championship held yesterday in Assisi, Italy. Riding Nobby, the Dubai-based Maria finished the 160km ride in 8hrs:10mins: 58secs while Shaikh Abdullah, who won a silver medal in the World Junior Championships held in Hungary recently, finished second on Castlebar Sobia in 8:21:33. Mubarak Khalifa Bin Shafya on Koum Des Jamets finished eighth while Shaikh Majid Bin Mohammad Bin Rashid Al Maktoum, (Spenda Crest Kamouflage) was unlucky to be eliminated in the final stage, according to provitional results. Earlier, the UAE's hopes of a team medal suffered a setback when Mohammad Ahmad Ali Al Subose on Kaysand Farrazah was eliminated just before the final phase while another UAE team rider Sultan Bin Sulayem on Maddiran made an exit when his horse was found lame after stage three. Another UAE rider Ahmad Salem Ali Sultan Al Subose on Kumait was eliminated after the second phase. Yesterday's ride was run in six phases. Team results were yet to be announced. Dubai: The Organising Committee of the Majid Bin Mohammad Endurance Race has announced cash prizes of Dh1 million to be given to winners. The 27km endurance competition will be held under the patronage of Shaikh Majid Bin Mohammad Bin Rashid Al Maktoum, Chairman of Dubai Culture, at the Dubai International Endurance City on October 1 at 5pm. It is restricted to horses from private stables and owned by UAE nationals. The winner will be given a gold medal and a Land Cruiser, while the second place will get a silver medal and a cash prize of Dh100,000, and the third place will earn a bronze medal and Dh50,000. A cash prize of Dh30,000 will be given to the fourth winner, while Dh20,000 to the fifth one and Dh10,000 to the sixth winner. A cash prize of Dh50,000 will be given to the best horse. Winners from the seventh to the tenth place will be given Dh5,000 each. Horses should register a maximum heart rate of 64 bpm within 20 minutes after crossing of the finish line. 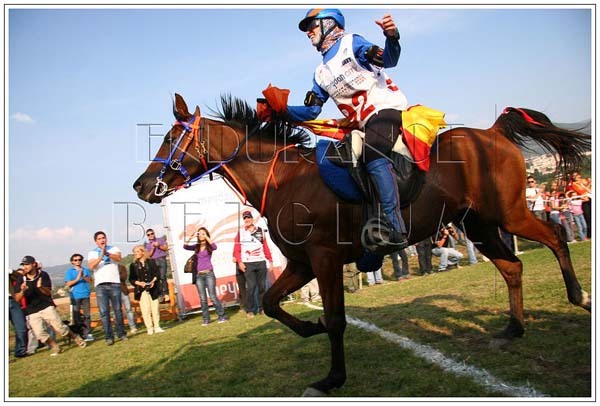 The official winner of Meydan City European Endurance Championships 2009 in Maria Alvarez Ponton. This is a great success achieved by Ponton, who is already the wolrd, european and spanish champion. Assisi Endurance Lifestyle 2009 celebrates the end of this important competition together happiness the spanish rider and all supporters of this sport. On a crisp September morning with the temperature at 56 degrees and the skies totally overcast 18 endurance racers were preparing to compete on the first day of the Rush Creek Reunion Endurance Race. Both days presented ideal racing conditions for both horse and rider with cool temperatures and a light wind until after 1:00 p.m. when it warmed a little and skies became partly cloudy through the finish of race time. The location was a beautiful meadow alongside Rush Creek, surrounded by huge cottonwood trees creating a horseshoe shaped area for campers along with ride headquarters, staging areas for vetting the race, P & R (pulse and respiration) stations and a large area for cooling, resting and feeding horses during their mandatory downtime between each leg of their race. The Rush Creek Land and Livestock's Arabian Horse Ranch, located one mile east of Lisco, Neb., hosted the AERC (American Endurance Ride Conference) sanctioned race the weekend of Sept. 5 & 6. Horse Ranch Manager and Ride Manager Lyle Sherfey, along with his wife Teresa and 15 volunteers worked long hours on both days to provide a 25- and 50-mile race on both Saturday and Sunday along with a barbecue followed by an awards banquet each evening after completion of the races. The races were run on a portion of Rush Creek's land, half-way between Lisco and Oshkosh, Neb., on the south side of the highway. An entirely new course from previous years was laid out. This year's terrain was meadows with sandy soil, high ridges, deep draws and creek crossings. Comments from racers who had attended the races in years past said it was better ground to run on this year with a wonderful campsite. The countdown is on for a spectacular weekend of endurance competition around the historic city of Assisi in Italy. A huge field is expected to line up with a confirmed entry of 106 riders from 25 nations competing over the 160km circuit. As well as European riders, the competitors will include representatives from the USA, United Arab Emirates, Qatar, Bahrain and Malaysia. The last FEI European Championships took place at Barroca D’Alva in Portugal with 88 riders from 20 different countries attending the event. Leading contenders for the individual championship will include: reigning world champion and bronze medallist in Portugal, Maria Alvarez (ESP) with Nobby and reigning European champion, Jean Philippe Frances of France with Hanaba du Bois; two former world champions, Sheikh Majid bin Mohammed Al Maktoum (UAE) and 1998 world champion Valerie Kanavy of the USA, one of the most charismatic figures on the circuit, will be among the strongest contenders. In the team contest, the host nation will be among the firm favourites with France, Belgium, Spain and Portugal among other hopefuls, with the open European contest being a top target for the teams from the UAE and Bahrain, which took team silver two years ago. The later stages of the race are flatter and could be fast depending on the surface conditions. The third “yellow” loop drops south to Bevagna before heading back to the vetgate at Valle Di Assisi along the Topino river valley. By this point, riders will have the home straight in their sights. At the end of the fourth “blue” loop of 24km, they will leave Valle Di Assisi for the last time returning to the Misura Village venue in the shadow of the majestic Assisi skyline over the steadily climbing 17.5km fifth orange loop. The final phase covering just 14 km will take finishers out over the first part of the opening loop of the day before swinging north above Bastia and doubling back on itself to the dramatic finish line just below the magnificent Saint Francisco's Basilica, in Assisi. Sponsors Meydan Group will have a purpose-built exhibition booth at the venue. The group’s key activities include: Meydan Racecourse, which is the first project to be launched in March 2010; Meydan Horizons, Meydan Metropolis and Meydan Godolphin Parks. Mohammad Al Khayat, Meydan Group's Commercial Director said, "This marks our first foray onto the global Endurance racing stage, and we are confident this partnership will continue to re-affirm the camaraderie that exists between both our countries. The UAE and Italy have a longstanding association bound by our equine history and heritage and it is this connection that further strengthens our mutual support of each other and to the dedication we have given to the sport of Endurance racing"
The world championships of eight different equestrian sports will begin exactly one year from today. The World Equestrian Games are held every four years and are the world championship of eight equestrian sports: Dressage, show jumping, eventing, reining, vaulting, endurance, para-dressage and combined driving. The world's best horses and riders will compete at the Kentucky Horse Park from September 25-October 10, 2010. This is the first time in WEG history that they will be held outside of Europe. The WEG will return to Europe in 2014 when they will be held in Normandy, France. In recognition of the start of the one-year countdown, tickets will go on sale to the general public at noon today. To find pricing information and purchase tickets, visit the World Equestrian Games official website at http://www.alltechfeigames.com/. Tickets can also be purchased through ticketmaster.com or Ticketmaster outlets. Tickets are sold by event and session, and prices range from $25-150. For many Americans, the 2010 WEG will be a once in a lifetime opportunity to see the world's top equestrians compete in one location. Leonard Liesens reports from Assisi, Italy on the Opening Ceremonies and the vetting in of the horses for the 2009 European Endurance Championship Open. The premiere event of the American Endurance Ride Conference (AERC), the annual National Championship ride, proved to be a weekend of celebration in Northern California on September 11 and 13. At the site of the annual Patriot’s Day ride in Greenville, CA, competitors arrived from all over the western U.S. and Canada to compete for AERC’s top prizes. The 100-mile championship ride, held Friday, was won handily by Lindsay Graham, a fourth-year veterinary student at the University of California at Davis. Riding Chris Martin’s seven-year-old chestnut Arabian gelding, Monk, Graham finished the technical course in nine hours and 58 minutes, 35 minutes ahead of second-place finisher Brad Green of Auburn, CA, riding Pawnee, his 10-year old Arabian-cross gelding. “I was planning on just finishing in the required FEI COC time,” said Graham, referring to the International Equestrian Federation’s certificate of capability time of 12 hours and 20 minutes. “We passed people in the vet checks as Monk pulsed down immediately at every check. All horses have now arrived at the venue. An amazing venue of several huge tents accommodating the restaurants, the place for holding events, the commercial stands. Then of course also the VIP tents and the tents installed for Malaysia, Bahrain, and UAE. The venue is installed on a plain, surrounded by hills. On one hill, the medieval city of Assisi (World Heritage) that will probably intensively be used by photograph as background. The trail has been described as "tricky" by all teams who pre-rode it. A lot of asphalt roads, some dangerous parts to be ridden on the first loop in the dark. Among the favorites : Maria Alvarez and Nobby, reigning World Champions, HE Sh Nasser from Bahrain on board Khandela des Vialettes (this horse is one of the best of the world, but the question is "how will he perform on this technical going"), current European Champion Jean-Philippe Frances on Hanaba du Bois. There will be two vetgates, one at the venue and one abroad that will be used for all loops except the last one. 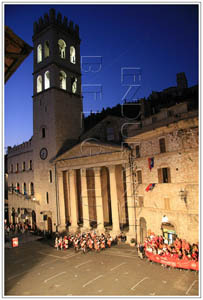 This evening, the opening ceremony with the presentation of the teams (on the central square of Assisi), then the gala dinner. Tomorrow the real things will start with the trotting of the horses, the chef d’equipe meeting and the preparation work of the crews. FOUR falls, six stitches and a wolf could be the start of a bad joke. But instead they are the injuries sustained and the foe encountered by Paul Chew when he took part in the world’s toughest horse race. The intrepid adventurer is recovering at his home in Southfield Road, Shortlands, after coming fourth in the Mongol Derby. Over the eight days it took him to complete the 1,000km race across Mongolia he kept a diary of his experiences. After the initial weigh where I officially became the heaviest person in the race at 84.5kgs. ROYAL Endurance Horse ride team captain Shaikh Nasser bin Hamad Al Khalifa will arrive in Italy today to lead the Bahraini squad at the European Championship 2009. Shaikh Nasser, the Bahrain Olympic Committee president, will be accompanied by Bahrain Royal Equestrian and Endurance Federation president and captain of Al Khaldiya Stables Shaikh Khalid bin Hamad Al Khalifa. Shaikh Nasser will be riding Kheopsy Du Pilat while Shaikh Khalid will compete on Khandela Des Vialette in this prestigious competition which will be flagged off on Saturday at 6am (Bahrain time). The two lead some of the finest Bahraini riders in this event which has attracted entries from 26 countries. Other Bahraini riders are Yousef Taher, Ghazi Al Doseri, Ahmed Abdulla Al Hazza, Abdulrahman Al Saa'd, Raed Mahmood and Jaffer Mirza. A maximum of six riders from each country are allowed to take part. Besides Shaikh Nasser and Shaikh Khalid, the final line-up for the Bahraini team includes Al Saad who will be riding Zirkonia, Al Hazza will take part on Ganda Koy, Mirza on Mexico and Al Doseri on Khyber. The race will be sponsored by Dubai Racing Club and will be held over 160kms divided into six stages. An opening ceremony will be held today at the Assisi's municipal square. The championship will be shown live on Bahrain Sports Channel following directives from Shaikh Nasser. After today's opening ceremony, the horses will be subjected to veterinary examination at the endurance village. The weight of each horse taking part should not exceed 75 kgs while maximum pulse rate at the veterinary gate after each stage should be 64 beats per minute within 20 minutes. An International Veterinary Symposium is also set for today at the conference room of the Grand Hotel Assisi. Endurance Riders Association of British Columbia held its last endurance ride of the season on Saturday, Sept 12th in Westbank. The Westbank Rocker, as it is called, was attended by 70 riders, with three of them hailing from Hope. Local riders Shelly Taylor, daughter Danielle and fellow rider Denise Pascucci, saddled up for the 22 mile ride through the telemark skiing trails of Crystal Mountain. Although billed as a 22 mile, the trails ended up amounting to 25 miles in total. After getting the all clear from the vets on Friday, all three horses settled in nicely for the night to prepare for the long haul the next day. The first loop consisted of 16 miles of up and down terrain, a few good mud holes and some spectacular scenery overlooking Westbank and Okanagan Lake. With an 8 a.m. start, the trio completed the first loop by 10:15 a.m., vetted in to make sure all was well with the horses, had their mandatory 45 minute break, then headed out again at 11:35 a.m. The second loop of nine miles proved much more gruelling and technical, having to follow small trails, going through lots of mud and enduring several climbs. Danielle Taylor, at the young age of 13, maneuvered her horse Sierra, like a seasoned pro, through the ever-changing terrain. The trio returned to base camp at 13:21 having completed the race in 4 hrs, 46 mins. With the final vet in, giving all three horses the clear, the race was complete, the horses unsaddled, fed and groomed and the riders happy with their results. Danielle placed 19th out of 32 riders and 6th place in the junior category, while mom, Shelly, placed 20th and Denise placed 18th overall. BAHRAIN'S national endurance horse ride team arrived in Assisi, Italy, yesterday ahead of the European Championship Open 2009, which gets underway tomorrow. The team, being led by Royal Endurance Team captain Shaikh Nasser bin Hamad Al Khalifa, reached the venue via Amsterdam after spending a night in Rome. Upon their arrival in Assisi, the team began training to acclimatise themselves to the location prior to the championship. Their horses had already been shipped. In this weekend's event, which is regarded as one of the world's most challenging championships, the Bahrainis will be looking to conclude their annual camp in Europe on a high note. Shaikh Nasser spurred the squad to a number of great results in their previous races in Europe this year. The team's first appearance in European competition was in the Compiegne Ride in France where the they successfully took a place on the podium. That was followed by a first-place finish in the team category of the Thetford Ride in the UK and then they maintained their momentum to claim victory in the 160km Open Championship in Germany. In this event, Shaikh Nasser will be accompanied by the Bahrain Royal Equestrian and Endurance Federation president Shaikh Khalid bin Hamad Al Khalifa and some of Bahrain's most prominent riders. It will be the second time for the team to compete in Italy, having participated in the World Junior Championship in 2003 in Rome where Shaikh Nasser led a group of Bahrainis to their maiden appearance in such an event. Shaikh Nasser confirmed that the team had reached a good level of fitness and were now set to compete with the continent's best riders, adding that both the horses and riders had been well-prepared during their summer camp in Europe. The Bahrain Olympic Committee president said he was confident that the team would again clinch a place on the podium after successfully taking an overall third-place finish in the previous edition of the championship in Portugal two years ago. Shaikh Nasser confirmed that the team's recent impressive participation in European races would certainly lift the team's morale prior to the prestigious Italian championship. However, this weekend's event will also be part of the Bahraini team's World Equestrian Games which is set to take place in Kentucky, the US, from September 25 to October 10 next year. The natural scenario of Assisi has been chosen to host the European Endurance Championship Open 2009, the most important event of the year for this discipline. The championship takes place every two years, on a distance of 160 km, and involves - like its name suggests - European nations as well as nations around the world, after the decision of the FEI in 2001 to add 'Open' in the event's title given the growing importance of the discipline. The last edition took place in Portugal with 88 riders from 20 different countries attending the event. At tomorrow's opening ceremony, which takes place at Assisi's municipal square instead of in the stadium, each nation will pass by in procession with its own flag in a mediaeval atmosphere and setting. The highlight of the event will be on Saturday when the best world riders will compete against one another, among them the official national teams of the countries of the Gulf region. THE world famous Tom Quilty Endurance ride was held last weekend in the Bunyip State Park around Tonimbuk, east of Melbourne. The challenge of riding 160km in 24 hours attracts riders from around the world. It began in 1966, when the remarkable Gabriel Stecher rode bare-back on Arabian stallion Shalawi. Queenslander Brook Sample has been riding in endurance events since he was a junior and took out the 1990, 1995 and 2002 events. Brook, on Tuldar Saladin, and his brother Matthew, on Brookleigh Ricardo, were first to cross the finish line, in a time of 9 hours and 50 minutes. They were awarded the middleweight section. Angela Hawks, 19, from Toowoomba, won the lightweight section on Crysari in 10 hours and 41 minutes. Brodie Freeman, on Cedar Ridge Magnetic, won the heavyweight section in 11 hours and 17 minutes. The junior winner was Shannon Hill, on Judah of Glendhu, in 12 hours and 5 minutes. The ride began at midnight last Friday. About 150 horses completed. Each was vetted five times during the ride for lameness, high heart rate or dehydration. Any rider that makes it home with a sound and happy horse proudly takes home a buckle. 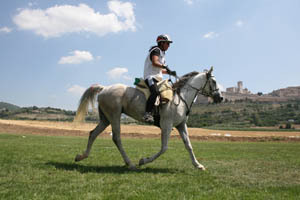 Riders and horses from 25 countries have been entered in the 2009 FEI Open Meydan City 160-km European Endurance Championships in Assisi, Italy, to be held on 26th September. For a complete list of entries, click here. In a thrilling finish, brothers Brook and Matthew Sample from Queensland, crossed the finish line in a tied finish to claim victory in Australia's premier 160km Endurance event. Brook, riding Tuldar Saladin and Matthew, riding Brookleigh Ricardo jointly claimed the famous Tom Quilty Gold Cup in a riding time of 9 hours, 50 minutes and 12 seconds. Kristie Taprell, riding Castlebar Concorde took 3rd position in a time of 9 hours, 55 minutes and 12 seconds. All three riders were members of the Australian contingent of riders contesting the World Endurance Championships in Terrengganu, Malaysia, last year. Internationally renowned endurance rider and multiple Quilty winner, Meg Wade, recovering from a serious fall earlier in the year, assisted with the presentation of the gold cup in an emotional hand over ceremony. Meg has vowed to be riding again as soon as her rehabilition programme allows her too. 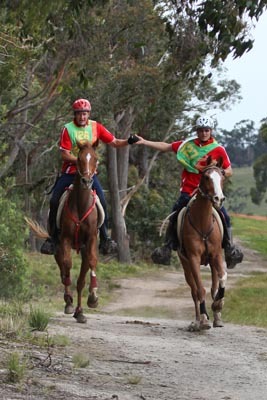 The event was based at the impressive Tonimbuk Equestrian Centre south east of Melbourne and the course traversed 5 loops of various lengths in and around the majestic bush land areas of the Bunyip State Forest. The course was described as a true championship course with undulating hills in all phases. Riders from all Australian states shared the course with riders from overseas nations including USA and Japan and many commented on the professionalism of the event, the high standards of horsemanship and horse management and the pure enjoyment of riding through beautiful Australian bush land. Event Director, Lissy Verity, could not have been more pleased with the way the event progressed and was overjoyed that the riders and their crews expressed how much they had enjoyed their experience at this year’s Quilty. An endurance rider, who was last week banned from competing for 10 months and fined CHF3,000 (£1,745) after his horse tested positive for testosterone, has alluded to suspicious behind-the-scenes activity in endurance racing in the United Arab Emirates (UAE). Danjera Kadhir, ridden by Rashed Mohd Al Seyegh, was sampled by the International Equestrian Federation (FEI) at the CEI JY* 119km in Abu Dhabi on 7 February. Levels of testosterone found in the horse constituted a doping offence. Following the positive result, the horse's groom at the See Al Salam Stable in Dubai was dismissed, and left the country at the end of March. In his defence, 19-year-old Al Seyegh said that he had, as an amateur rider, relied on the "reputation, skill and care of the trainer and the stable itself that his horse was competing free of prohibited substances". Endurance NZ is please to announce the selected 2009 Trans Tasman Teams who will compete against Australia at Ruahine on the 21st and 22nd. Congratulations to all combinations and we wish them well when they take on the Aussies! "I was informed at approximately 11.00am this morning that a drug test performed on my horse Forrest at the Euston Park Ride on the 9th August was positive. As a result I have been suspended by the FEI and am now not allowed to ride in the European Championships in Assisi. The substance involved is something that I have never heard of before and apparently is usually fed to pigs in order to promote growth. I can only at this stage say I am trying to find out how on earth this substance was found to be present in my horse and to state categorically that I have never knowingly fed it to my horses. I am obviously devastated by this news and I will do everything in my power to clear my name, I have spent most of the last ten years training myself and my horses to compete and succeed at this level and now to have all of that taken away is devastating. I would like to end by wishing the rest of the team all the success in the world in the European Championships." LEXINGTON, KY - Meydan Group, LLC developers the luxury Meydan Grandstand and Racecourse in Dubai, owned by Sheikh Mohammed bin Rashid Al Maktoum, has signed on as presenting sponsor of the Endurance Competition during the 2010 Alltech FEI World Equestrian Games. Sheikh Maktoum, United Arab Emirates Vice President, Prime Minister and Ruler of Dubai is expected to compete in the Endurance Competition which according to the World Games Foundation "will pit champions from more than 30 countries in the equestrian discipline of endurance riding, with competitors vying to complete a designated 6-loop course spanning 100 miles." Sheikh Maktoum's wife, Princess Haya, is also the president of the FEI, governing body of the Games. "We are extremely excited and proud to announce this sponsorship with Meydan," CEO of the World Games 2010 Foundation Jamie Link said in a press release. "This not only further illustrates their dedication to the growth of horse sport around the world but also to the global nature of the 2010 Games. We are honored to have Meydan as a partner." The Endurance Competition, one of eight disciplines awarding a world champion during the Games, will take place on Sept. 26, 2010, the second day of the 16 day Games. The amount of the sponsorship was not announced by the Games Foundation. Iniziano ad arrivare in Italia i primi atleti che dovranno cimentarsi nel CH-EU-E 4* 160 km. europeo. La prima ad essere avvistata dagli obiettivi di Sportendurance e l'amazzone belga Muriel Guillaudeux, scovata in prossimita di Spello in Umbria. Ad accompagnarla nell'anello di 20 km. che simula alla perfezione il duro anello rosso che le si presentera agli europei di Assisi, Gianroberto Trucchi, chiamato a presiedere la Commissione giudicante della prossima Coppa delle Regioni 2009. Acclimantamento, sgambata di rifinutura, relax, concentrazione, questi gli ingredienti per il binomio belga in prospettiva europeo, aspettando la fuoriclasse amica Karim Boulanger ed il suo Poespass, uno dei cavalli favoriti; arrivera domenica. Begin to arrive in Italy the first athletes who will compete in the CH-EU-E 4 * 160 km. The first to be sighted by the objectives of the Amazon is Sportendurance Belgian Muriel Guillaudeux, unearth near Spello in Umbria. To accompany her in the ring of 20 km. Simulating to perfection the hard red ring that will be presented to the Europeans of Assisi, Gianroberto Tips, named to chair the judging commission for the next UEFA Regions 2009. Relaxation, concentration, these are the ingredients for the combination Belgian European perspective, waiting for the champion and his friend Karim Boulanger Poespass, one of the favored horses, will arrive Sunday. Notizia appena giunta in redazione ci informa dell'ottima trasferta del Team Bosana in Polonia presso le strutture del Equisport di Warka. Esperienza oltre confini degna di essere ricordata per i tre binomi azzurri e le loro assistenze che dopo un viaggio di 1700 km. hanno partecipato alla competizione riempiendo il podio! Abbiamo raccolto i commenti a caldo dei tre chiaramente soddisfatti. Diana: "e stata una gara molto impegnativa, non in riferimento al terreno o ai dislivelli ma come clima e come fatica psicologica. Essendo pochi i concorrenti in gara abbiamo corso contro noi stessi facendo tutta la gara in solitaria. Per due cavalli giovani come Pervinca e Ninfea resistere alla fatica psicologica e stato piu difficile che non cedere alla fatica fisica. Il percorso molto ripetitivo, tutto piatto ed il temporale quasi costante a rendere il fondo molto rischioso, non ci hanno certo aiutato. La gara non era facile, se pensate che il terzo e arrivato a 2h 36' e che comunque c'erano cavalieri di diverse nazioni: NED, FIN, EST, CZK mi ritengo molto soddisfatta. Comunque lo scopo della spedizione era abituare i cavalli ad una trasferta impegnativa, testarli su terreni morbidi a buone medie e farli crescere atleticamente. Direi obiettivo centrato". Daniele: "e stata la nostra prima 160 km., mia e di Ninfea; ho mosso il mio primo passo da endurista vero supportato da una delle migliori atlete italiane, montando un'ottima cavalla, in un posto bellissimo e con l'appoggio di un team assistenza grandioso … cosa posso desiderare di piu!" Angela: "sono felice, abbiamo scoperto una bella gara con un'organizzazione ottima e attenta ai particolari: bellissima cerimonia premiazione! La mia cavalla e stata ottima nella sua prima 120, buona media, ottimi rientri e un ultimo giro degno di nota (20,74 km/h). Ciliegina sulla torta ha vinto la sua prima 120 a casa sua! E' infatti uno dei cavalli scelti da papa qui in Polonia e presente alla Vetrina del cavallo da endurance che organizziamo ogni anno in azienda. Quale migliore garanzia di serieta e quale migliore figura come preparatori italiani di cavalli da endurance?" News just reached the office informs us of the excellent travel Team Bosana in Poland to the structures of Equisport of Warka. Experience beyond borders worthy of being remembered for the three combinations blue and their assistants who after a journey of 1,700 km. participated in the competition by filling out the podium! We gathered the comments of the three hot clearly satisfied. Diana: "It was a very challenging race, not in reference to the hilly terrain or climate, but as hard as psychological. Since few competitors in the race we ran against ourselves doing the entire race solo. For two young horses as Periwinkle and Ninfea resist psychological fatigue was more difficult than giving in to physical fatigue. The trail is very repetitive, almost all flat and the storm continued to make the fund very risky, there have certainly helped. The race was not easy, if you think that the third came to 2h 36 'and that there were still riders of different nations: NED, FIN, EST, CZK, I am very satisfied. However the aim of the expedition was to accustom the horses to travel a challenging test on soft soil with good average and make them grow athletically. I would say goal-centered. Daniel: "It was our first 160 km., Mine and Water Lily, I made my first real step enduro supported by one of the best Italian athletes, mounting a good horse in a beautiful place and with the support of a great support team ... what do I want more! " Angela: "I am happy we found a good race with good organization and attention to detail: a beautiful award ceremony! My horse was very good in his first 120, good average, good returns and a last round of note (20 , 74 km / h). The icing on the cake he won his first 120 at home! And in fact one of the horses chosen by Pope here in Poland and attended the Showcase of endurance horse that we organize every year in the company. What better guarantee of seriousness and what better figure as preparatory Italian horses for endurance? " Tom Quilty Gold Cup event organisers are: Alex Enticknap, Sandra Feil, Sue Cousin, MartinDeGroot, LissyVerity, Cardinia Shire mayor Bill Pearson and Jane McLaughlin. A civic reception was held in Pakenham on Tuesday night as the official countdown to one of the world's most prestigious horse endurance rides began. About 200 competitors are expected to saddle up for the Tom Quilty Gold Cup, a 160km ride, at midnight this Friday. The course is based at the Tonimbuk Equestrian Centre, and includes the surrounds of the Bunyip State Park while traversing private land, bush tracks and all-weather roads. It is the first time that the world famous event will be held in Victoria. Event organiser Lissy Verity said a hard working committee had been preparing for the event for almost three years and had surpassed many hurdles along the way. The cup, which was to be held last October, was postponed after the Equine Influenza outbreak. Then, there was a recession and the Bunyip Ridge Bushfire, which devastated the Bunyip State Park. Cardinia Shire mayor Bill Pearson said he was eagerly awaiting the event and paid tribute to those who had brought it to fruition. "This race is the stuff legends are made of," he said at the civic reception, held at the Cardinia Cultural Centre. Riders and support crews from across Australia and from overseas countries, including Malaysia and Russia, will converge on the Shire for the ride, which winds up on Sunday. Cardinia Shire chief executiveGarry McQuillan said the event was expected to inject $800,000 to $1 million into the local economy. Residents wanting to see the start of the ride are advised to be at the Tonimbuk Equestrian Centre, in Sanders Road, Tonimbuk, by 11pm on Friday as road blocks will be in place after that time. A public viewing point will be set up on Camp Road for people wanting to view the action over the weekend. ULAN BATOR — More than two dozen horsemen raced across the finish line in Mongolia this month after a test of endurance that would have impressed even legendary conqueror Genghis Khan. The international group of riders pounded 860 kilometres (530 miles) across the Asian country's vast grasslands in the 10-day Mongol Derby, which organisers call the world's longest horse race. South African architect Charles van Wyk, 28, tied for first with local rider Shiravsambuu Galbadrakh, leading home a field from 10 countries including Argentina, Australia, Britain, New Zealand, Spain and the United States. The Adventurists, a Britain-based organisation that dreamed up the derby, designed the race as a way to promote Mongolian tradition and culture -- while raising money for charity. Participants changed steeds every 40 kilometres or so at urtuus -- horse relay stations patterned on those used during Genghis Khan's time to deliver post across the Mongol Empire, from the Pacific Ocean to the edge of Europe. "Modern life is changing the steppes but that does not mean they are all coming to the city," Van Wyk told AFP. "In fact the quality of life is quite good on the steppes and even the foreign riders longed to go back after we returned to the city." Nomads in traditional gers, or round felt tents, manned each station, providing riders with boiled mutton and fermented mare's milk, a common drink in Mongolia. But on some nights, they slept in the open. "There were days when I wondered why I had even started this race because I was so tired. But then I would get back into the rhythm of things and press on," said Van Wyk. Best Condition CHARI'A D'ALAUZE 1998 Arabian, one of PERSIK's grand-daughters! Fastest Vet Gate Presentation time: Castlebar Sobia ridden by Sheikh Abdullah bin Faisal Al Qasimi (UAE) – 36 seconds at Vet Gate 3. The fifth FEI Young Rider and Junior World Endurance Championships took place from 4 to 6 September 2009 in Babolna, Hungary. The run up to the competition was hot and dry with temperatures reaching 34 degrees during the week prior to the competition. Whilst Hungary have previously hosted Driving Championships this was the first time they had attempted the organization of an Endurance Championship. The 23 countries entered into the competition were hosted in the stunning surroundings of the Babolna Arabian Stud founded in 1789 and famous for breeding the Shagya Arab. The Pre-Ride vetting took place on Friday 4 September morning with the metabolic examination conducted in the stables and the trot up taking place under the beautiful Hungarian sun. 93 horses were presented and all passed fit to start the 120km course. Following the launch of Endurance riding as an official Pony Club discipline in March, The Pony Club is really excited about their coming inaugural Endurance Championships, to be held at The College EC, Bedfordshire. The Championships will be the culmination of Pony Club Endurance rides all over the country throughout the year, and entry numbers have been very pleasing for the first year with over 50 Pony Club competitors anticipated at the Championships. Competitors will be split across Junior (eight to 12 years) and Senior (over 13 years) levels, both individually and in teams. As with the other Pony Club disciplines classes will be set at Novice (32km at 10km per hour), Intermediate (40km at 11km per hour) and Open (40km at 12km per hour). Pony Club Endurance is generously supported by new sponsor Carr & Day & Martin and the Championship will be running alongside the EGB Cromwell Group’s annual ‘The College Ride’. Spectators are welcome at the event, with no charge for entry, and food is available to purchase. Espanya, cuyo mejor resultado fue el octavo puesto de Eulalia Gonzalez y "Sadek P", consiguio clasificar a la mitad de sus binomios. Segun los resultados provisionales, 67 binomios se clasificaron, 22 fueron eliminados y seis se retiraron. Con un tiempo de cinco horas, 15 minutos y diez segundos (5:15:10) y una velocidad media de 22,464 kilometros hora (kms./h. ), tras correr la ultima fase a 29,478 kms./h., el emirati Al Marouqi Hussain Ali y "Sergai" se hicieron con la victoria individual, por delante de su compatriota Bin Faisal Al Qasimi He Sh Abd y "Castlebar Sobia" (5:15:12 y 22,462 kms./h.). Laetitia Goncalves (5:20:01 y 22,124 kms./h. sobre "Jasmina des Ayssade") gano el bronce para Francia, que clasifico a cinco binomios entre los once primeros (puestos 3rd, 4th, 5th, 9th y 11th). France team gold and individual bronze, and the United Arab Emirates, team silver and individual gold and silver, were the winners of the Raid World Championship for Junior and Young Riders (Babolna, Hungary). Spain, whose best result was eighth place Eulalia Gonzalez and "Sadek P", managed to qualify for half of their couples. On Saturday, September 5 was played in Babolna (Hungary) on Raid World Championship for Junior and Young Riders, proof of 120 kilometers with the participation of riders and horses from 29 countries, including six Spanish. According to provisional results, 67 couples were classified, 22 were eliminated and six were retired. With a time of five hours, 15 minutes and ten seconds (5:15:10) and an average speed of 22.464 kilometers hour (Km / h), after running the last stage to 29.478 kms. / H, the UAE Hussain Ali Al Marouqi and "Sergai" were made with the individual victory, ahead of compatriot Bin Faisal Al Qasimi Abd I Sh and "Castlebar Sobia" (5:15:12 and 22.462 kms. / h). Laetitia Goncalves (5:20:01 and 22.124 kms. / H on "Jasmina des Ayssade") won the bronze for France, which qualified for five couples among the first eleven (post 3, 4th, 5th, 9th and 11th). Excellent performance for young riders to Babolna blue combinations. Alice Spinazze, Serena Fossi e Luca Zapetini concludono tutti ad una media superiore ai 19 orari che vale il sesto posto come TEAM. Si impone come da pronostico la Francia, secondi UAE chiude il podio a sorpresa l'Ungheria, quarto il Belgio, poi Brasile e appunto l'Italia. Il sesto posto a squadre, supportato dai complimenti del Presidente Federale Andrea Paulgross ai giovani atleti impegnati ai Mondiali J/YR ungheresi, traccia una linea importante dalla quale partire alla volta di risultati ancora piu significativi. Tutti i binomi in gara ed in squadra, hanno mantenuto medie orarie al di sopra dei 18 km., con punte di 19,10 per Serena Fossi e Luca Zappettini seguiti dal 18,92 di Alice Spinazze. Unico rammarico la sfortunata e prematura eliminazione di Schadja agli ordini della campionessa italiana YR Vittoria Ciuchi; il binomio azzurro, con una prova al di sopra dei 20 km/h, performance certamente nelle "gambe dell'animale", avrebbe potuto portare l'Italia nelle zone altissime della classifica generale. Complimenti anche agli altri atleti azzurri che, seppur eliminati, hanno senz'altro aggiunto un tassello importante al proprio bagaglio culturale e sportivo. Nei prossimi giorni seguiranno approfondimenti, reportage fotografici, video del back-stage dei mondiali, interviste, partenze, arrivi e molto altro. Alice Spinazze, Serena Fossi and Luke Zapetini all claim to an average of more than 19 hours worth sixth place as a team. Itself as the prediction from France, according to UAE closes the podium surprise Hungary, fourth in Belgium, then Brazil and indeed Italy. The sixth place team, supported by the compliments of the Federal President Andrea Paulgross to young athletes taking part in the World Cup J / YR Hungarian, trace a line from which important at a time of even greater results. All combinations in the race and in teams, have retained the hourly averages above 18 km., With a peak of 19.10 per Serena Fossi and Luke Zappettini followed by Alice Spinazze 18.92. Only regret the unfortunate and untimely removal of Schadja the orders of the Italian champion YR Victoria Ciuchi, the pairing of blue, with a test at above 20 km / h, performance, certainly in the "legs of the animal," could bring Italy in areas of high ranking general. Congratulations also to the other athletes that, although removed, have certainly added a significant step towards their culture and sport. In the coming days later consolidated, photojournalism, video of the back-stage of the world, interviews, departures, arrivals and more. Hussain Ali Al Marzouqi and Shaikh Abdullah Bin Faisal Al Qasimi finished first and second in the World Endurance Championship for Junior and Young Riders in Hungary. Babolna, Hungary: The UAE registered another emphatic victory on the world endurance stage when Hussain Ali Al Marzouqi and Shaikh Abdullah Bin Faisal Al Qasimi completed a 1-2 finish at the World Endurance Championship for Junior and Young Riders here on Saturday. Besides the gold and silver in the individual event, the UAE also won its second successive team silver medal behind France to keep its success record going. While it was a great achievement by Al Marzouqi in his first-ever ride for the UAE national team, Al Qasimi's silver medal-winning effort was his third successive podium finish in the World Endurance Championship for Junior and Young Riders (under 21 years). Al Qasimi earlier won the silver medal in Bahrain in 2005 and the bronze medal in Argentina in 2007 where the UAE also won the team silver medal. The UAE riders dominated yesterday's event with Al Marzouqi on Sergai completing the 120-km distance in 5 hours 15 minutes 10 seconds at an average speed of 22.46 kilometres per hour. Almost finishing together, but timed two seconds behind the winner was Shaikh Faisal on Castlebar Sobia while Goncalves Lactitia of France on Jasmine Des Ayssade came third in 5:20.01 followed by two other French riders. Earlier, Ali Ganem Al Merri on Ridasa Dr GBM, was among the leaders but his horse went lame in the third stage of the four-loop race. However Mohammad Ahmad Ali Al Subose on Cloud Valley Armani completed the ride to give UAE the team silver medal behind the French while Shaikh Saqr Bin Faisal Al Qasimi on Castlebar Trueman and Majid Mohammad Al Sabri on Mitsouku de Sauveterre also completed the ride to help UAE end the day on a memorable note. Speaking to Gulf News from Hungary, Ali Mousa Al Khameri, the Chef d'Equippe of the UAE team said, "This is a great win and coming during Ramadan we dedicate this victory to the Rulers of the emirates." "We had many in the six-member squad who were taking part in an international event for the first time including the winner and they showed great skills in tackling this varied terrain here," Ali Mousa said. "Shaikh Faisal, with this third success at this level, helped the other members and ensured the UAE's flag kept flying high," the Dubai Equestrian Club chief said. "With the European Open Championship coming in three weeks time in Italy this is a great start to the season," said Taleb Dhaher Al Muhairi, Secretary General of the Emirates Equestrian Federation. "Under the Federation President Dr. Shaikh Sultan Bin Khalifa Al Nahyan, we have laid special emphasis on rides for young and junior riders and today's result at the world level has been a reward for those efforts," Al Muhairi said. Hussain Ali Al Marouqi of the UAE has won the 2009 FEI Junior & Young Rider World Endurance Championship in Babolna, Hungary, riding Sergai. Second was HE Shaikh Abdulla bin Faisal al Qasimi of the UAE on Castlebar Sobia, and third was Laetitia Goncalves of France on Jasmina Des Ayssade. Abu Dhabi: The UAE's Shaikh Abdullah Bin Faisal Al Qasimi leads a strong 6-member team in today's World Endurance Championship for Junior and Young Riders to be held in Babolna, Hungary. Shaikh Abdullah, who will be chasing a podium finish in the individual event for the third consecutive championship, will also be hoping to ensure the UAE go one better than the team silver medal-winning performance that they achieved in Argentina in 2007. The other members of the UAE team are Shaikh Saqr Bin Faisal Al Qasimi, Mohammad Ahmad Ali Al Subose, Ali Ganem Al Merri, Hussain Ali Al Marzouqi and Majid Mohammad Al Sabri. Shaikh Abdullah won a silver medal when the World Endurance Championship for Junior and Young Riders was held in Bahrain in 2005 and followed it up with a bronze medal finish in 2007 in Argentina. Apart from Shaikh Abdullah's bronze in Argentina, the UAE had won the team silver and Mohammad Ahmad Ali Al Subose returns after playing a crucial role in that team medal success. Over 100 riders from 26 countries will be taking part in today's championship which will be run over a distance of 120 kilometres. Competitions will be held on the individual as well as team championship and the UAE along with Uruguay, who won the team and individual gold in 2007, start among the favourite nations. While Shaikh Abdullah is expected to ride Castlebar Sobia, Shaikh Saqr will be on Castlebar Trueman with Al Subose riding Cloud Valley Armani, Al Merri on Ridasa Dr GBM, Al Marzouqi on Sergai and Al Sabri on Mitsouku de Sauveterre. Spain and France along with hosts Hungary are also expected to be strong contenders in today's event. The event is being held at the historic Babolna National Stud farm in Hungary which was founded in 1789 and has been breeding Arabian horses since then. Work in progress at the Misura Village, located in Pallareto, just below the magnificent Saint Francisco's Basilica, in Assisi. The village will host with outstanding features the incoming event. Ten thousand square meters of tensioned structures will lodge the expo areas with two restaurants, a conference hall, a press room, the Poker Texas Hold'em room and the VIP lounge. The Misura Village it's going to have also a reserved part for the tents of the Royal families that will participate at the competition and an Indoor Arena for free concerts and entertainment. Assisi Endurance Lifestyle is getting ready to welcome in style, with unique arrangements, the eleven days of sport, communication, art, culture, science and free entrance night concerts. Hospitality will be one on the event's point of strength that will include the Meydan FEI Open European Championship 2009. Want to spend a Kentucky autumn day watching some elite equine athletes and riders do their thing against a backdrop of Bluegrass? How about getting an inside view of the veterinary work behind the scenes at an international endurance event? The organizers of the endurance portion of the 2010 Alltech FEI World Equestrian Games are looking for a few good volunteers--160, in fact--to assist at their Kentucky Cup Endurance test event Oct. 14. The available positions include vet scribes, trail stewards, road crossing marshals, training trail marshals, stables stewarding, hospitality assistant to officials, and food runners. Some positions require a full day commitment, while others are broken into sessions. Most of the jobs don't require specialized knowledge about endurance competition, explained Discipline Manager Emmett Ross. Those with some experience working in equine health might be most suitable for the veterinary scribe positions. The Kentucky Cup Endurance will feature both a 75 mile (120 km) race, and a 100 mile (160km) race. Both races will start at the same time the morning of Oct. 14. Riders from 18 countries are expected to compete, including current and past national and world champions. The base of operations is the Kentucky Horse Park, with the course stretching out into surrounding property. The 2010 Alltech FEI World Equestrian Games are the world championships of the eight equestrian disciplines of the Fédération Equestre Internationale (FEI). The competition is held every four years, and the 2010 edition will be the first hosted in the United States. The games will run Sept. 25-Oct. 10, 2010. Tickets go on sale Sept. 25, 2009. Tougher stable security, more paid officials and an independent integrity unit to maintain a "corruption-free" environment are among radical proposals for equestrianism from former Metropolitan Police chief, Lord Stevens. Stevens headed-up the International Equestrian Federation's new ethics panel in May. His recommendations were published on the same day that former Olympic dressage champion Isabell Werth was handed a six-month ban after her horse, Whisper, tested positive for an anti-psychotic. Many recommendations are aimed at speeding up communication processes, minimising "conflicts of interest" through over-reliance on multi-tasking volunteers, and tightening up apparently casual procedures; horses have been medicated during championships without written permission. Princess Haya – the wife of the ruler of Dubai – was elected to the FEI presidency on a clean-sport platform and initially set up a commission under Professor Arne Ljungqvist, vice-president of the World Anti-Doping Agency. However, the FEI was wrong-footed this spring by the positive dope tests returned on endurance horses ridden by Princess Haya's husband, Sheikh Mohammed, and his son, Sheikh Hamdan bin Mohd Maktoum. Two more days remain until the 2009 FEI Junior & Young Rider World Endurance Championship which will be held in Babolna, Hungary. 95 riders are pre-entered. The ride will take place near the Babolna National Stud farm which was founded in 1789. There are just a few unique studs in the world, that operate for two hundred years, to preserve, promote and develop the values in breeding Arabian horses, created by the efforts of the predecessors. The goal of Babolna Stud is not only to preserve, but also to convey their equestrian heritage to the general public, which once was closely connected to warfare, now has become the vehicle for a noble sporting activity. The history of Babolna Stud, that is world famous today, looks back to the end of the 18th century. In 2003, the previous president of the Hungarian Equestrian Federation's Endurance Committee, Bela Banyai, together with Tamas Rombauer, the previous president of the Babolna Stud, decided to organise an international endurance competition in Babolna, that would have gone from Babolna to the Austrian border. The competition was planned to be on the day of EU accession of Hungary. Technical obstacles did not make possible to make this dream come true, therefore it became the first international CEI*** endurance ride of Hungary in 2004. This was the first round of the Central European Endurance Cup. By now the Babolna Derby has become a traditional ride; in 2009 it was organized for the 6th time. The competition is very popular because of its easy, sandy track and its historical environment. Over 100 horses and riders visit our competition each year. In 2007, the organising committee and the small endurance team decided to apply for the right to organise the 2009 World Endurance Championship for Juniors and Young riders. After four years of excellent teamwork and satisfied riders they knew that they owned all conditions needed to perform well. Are 26 the nations, listed in the Nominated entries at the Meydan City FEI Open European Endurance Championships on 26 September 2009, the most important event for the ongoing year. At the competition - constituted by 6 laps that winds along 160km in the Umbrian country side - are going to participate 19 European nations, 7 non EU nations for a total of 116 riders, 89 European and 27 non EU that will challenge for the European and Open Challenge scheduled for September 26th at 5.00 am from the Misura Village. These are the numbers of the event, waiting for the definite Entries, that will be confirmed September 21st , that clearly show a great event, most of all for the rides reputation. In Assisi sport, environment, culture and history will be enhanced Sport, environment, culture and history can be enhanced here as in few places in the world. This thanks to the special contribution of the binomials that will compete in the race that will wind along 5 municipalities. Meydan City FEI Open European Endurance Championships 2009 are also this but, most of all, are a melting pot occasion between people, culture and diverse stories in the name of sport. Assisi has always been ambassador of welcoming culture and ideals sharing and is perfectly suited to be a the host of the event for all over the world horses and riders. La disciplina de Raid ja te nou Campio de Catalunya, en la figura de Jordi Romero. El genet de Roda de Ter, que va muntar al cavall Roig, va aconseguir el millor temps del recorregut de 120 Km, que es va disputar aquest cap de setmana a les proximitats de Ripoll. El nou campio de Catalunya, va realitzar un temps final de 8 hores, 39 minuts i 40 segons, superant per un estret marge a una de les màximes favorites al titol, Maria Alvarez. The discipline has already Raid Champion of Catalonia CEI**, the figure of George Romero. The rider of Roda de Ter, who rode the horse "Roig", had the best time to travel 120 km, which was held this weekend in the vicinity of Ripoll. The new champion of Catalonia, made a final time of 8 hours, 39 minutes and 40 seconds, beating by a narrow margin in a top favorite for the title, Mario Alvarez. Jaume Punti won the bronze.